Her self-portrait in 1909 reveals much. Cover her face, and you see the beginnings of expressionism, already veering into abstraction. Then remove the covering, and the painting morphs into impressionism, dominated by the delicately painted detail of her face. The eyes timid and anxious, the lips pressed together nervously. The enormous hat, garlanded with daisies, looming over her head like a protective helmet. This woman is intensely aware of herself and feels a wistful longing, anxiety and insecurity in her picturesque surroundings. Even while she’s depicting herself with astonishing talent and an exceptional feel for colour. 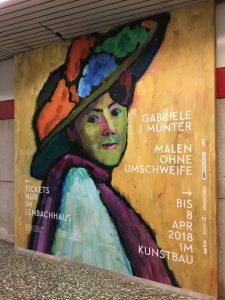 Born in Berlin in 1877, Gabriele Münter was a prolific painter and graphic artist of the 20th century who, remembered chiefly as a member of the Expressionist Blaue Reiter movement in southern Germany and lover of Russian Expressionist Vasily Kandinsky, tragically faded into relative obscurity. A vibrant retrospective of her work in Munich’s Lenbachhaus – a modern art museum that has her to thank for its international renown – describes her development as an artist and displays her masterful, brilliantly colourful work. Münter’s beginnings as an artist can be traced back to a trip she took with her sister after the death of her parents to visit relatives living in the US. Receiving the gift of a camera, she began to experiment with photography, taking atmospheric, painterly, often comical photographs of places in Missouri, Arkansas and Texas. They’re not so much snapshots as visual narratives. Her street scenes, landscapes and portraits – sometimes featuring the long, slim shadow of the photographer – reveal themes she would often repeat in her paintings. She moved to Munich in 1901 and began to study painting in earnest. As a woman, she was unable to attend a state art academy, so she enrolled first at the art school of the Munich Women’s Art Society, then at the progressive Phalanx school – where Kandinsky was an instructor. They fell in love and had a secret affair, leading to their engagement, although Kandinsky was married. When the school shut down, they travelled throughout Europe and to Tunisia. Taken with the alpine landscape in southern Bavaria, Münter purchased a house in Murnau in 1909, which became the centre of the Blaue Reiter movement, spearheaded by Kandinsky, Franz Marc, Alexej von Jawlensky, Marianne von Werefkin, August Macke and herself. After the beginning of the First World War, Kandinsky returned to Russia; and Münter spent 1915-1920 in Scandinavia. Kandinsky visited her one last time in Stockholm in 1916, but then never answered her letters. He had divorced his wife in Russia in 1911, but then married another, younger woman in Moscow. He didn’t let Münter know; she had to find out about it from others. After an angry exchange of correspondence, she refused to hand over the many paintings that were still in “their” house in Murnau. When the Nazis gained ascendance in Germany and vilified “degenerate” art – weirdly dedicating an exhibition in Munich to the modern art they found decadent and depraved – Münter and her new partner, art historian Johannes Eichner, wrapped the paintings in newspaper and hid them in the cellar behind jam jars. 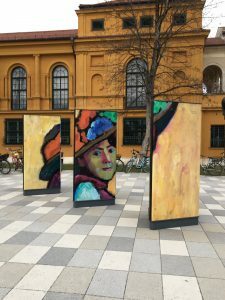 Years later, for her 80th birthday, she made a present of them – more than 80 of Kandinsky’s paintings as well as hers and those of other exponents of the Blaue Reiter – to the civic gallery in the Lenbachhaus, turning it instantly from a small provincial collection into an internationally famous museum. 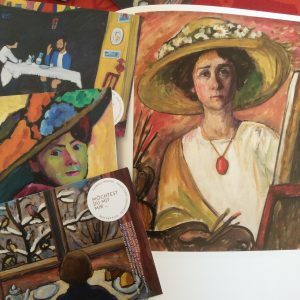 Despite her possession and preservation of these paintings, Münter spent the remaining years of her life still painting but in relative poverty. 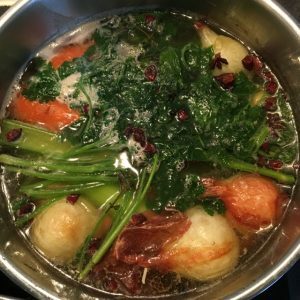 She tried to swap her paintings for bread, milk and meat, not with frequent success. (There must be dozens of residents of Murnau kicking themselves for not taking her up on the exchange.) She was shy and overshadowed by Kandinsky and the other male artists in her circle – and exhorted by her later partner Eichner to paint nice pictures people might like to hang in their living rooms – so she kept to herself. She died in 1962, leaving her estate to the Gabriele Münter and Johannes Eichner Foundation. Her relative obscurity in comparison with her Blaue Reiter colleagues is puzzling, especially as there had been extensive exhibitions of her work, for example in Copenhagen and Stockholm. Throughout her life, Münter absorbed the spirit of the avant-garde artistic movements of the early 20th century, and her oeuvre shows a mastery of Impressionism, Expressionism, New Objectivity, and includes graphic arts techniques such as wood and linoleum printing. Her work features paintings of masks reminiscent of James Ensor’s, African influences like those of Picasso’s circle in Paris, and local folk and religious art. She – as well as some of the other artists in her circle – also studied the Central European traditional art form of reverse-glass painting (Hinterglasmalerei), which exerted a strong influence on their style. Münter is celebrated for her exceptional and expressive use of brilliant, vivid colour in her landscapes, portraits and abstract work. And apart from that one telling self-portrait, she crops up frequently in other paintings – usually from behind, looking into the scene herself. She wants the viewer to look not at her, but with her at what she sees. And her vision of the world is astonishing. When the UK voted yes to Brexit, they forgot a minor detail. This minor detail – Ireland – will, as journalist and intellectual Fintan O’Toole explained, make negotiating any kind of Brexit at best an impossibility. 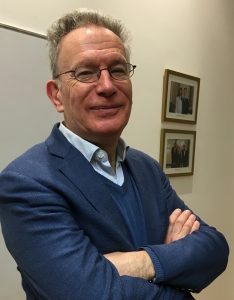 A long-time, award-winning columnist with the Irish Times, O’Toole presented a lecture at Munich’s Globe Business College on 19 January that approached the political phenomenon of Brexit from a historical and uniquely geographical viewpoint. Looking over from Ireland – a perilously close former colony of Great Britain, its closest neighbour across the Irish Sea – the prospect of Brexit appears absurd and dangerous to peace and stability – an own goal for a chimeric concept of Britishness. “They don’t do revolutions”. Their one revolution was “Glorious” because it was “bloodless”, and they didn’t have a socialist or fascist revolution in 20th century as so many of their European neighbours did. So this nationalism is poorly articulated, which made it much easier to grow without much attention. One of the things a concept of nationalism needs is an oppressor, some kind of threat from outside, in order to engender fear, which in turn binds people together and strengthens its fabulous narrative. Because, as O’Toole states, “the basic problem of nationalism is that nations are ambiguous and fluid entities, a people held together by a common misconception of their origin”. A geographic unit of people that used to be the hub and chosen of an empire still retain an identity as an imperial power. Witness the “brilliant comedian and performance artist called Jacob Rees-Mogg” – a Eurosceptic conservative British member of parliament – who cites Agincourt, Crécy and Waterloo – all historical battlefields where the English won a resounding victory. But recalling old military successes from the Napoleonic wars of the 19th century – never mind the Hundred Years War of the 14th and 15th centuries – has embarrassingly little to do with the reality of the United Kingdom of the 21st century and its global position. Instead, during the first round of talks, the negotiators ended up scrambling to paste over once again this huge rift in the logic of Brexit. The term they finally came up with was “full regulatory alignment”. O’Toole appealed to any mathematicians in the audience. As far as he was aware, if A = B and B = C, then A must equal C. Applied to the circumstances surrounding Brexit, he surmised, “Ireland has regulatory alignment with Northern Ireland, and Northern Ireland has regulatory agreement with the UK. But Ireland also has regulatory agreement with the EU. So the UK also has to have regulatory alignment with the EU.” In other words, he says, it’s not going to work.